Instagram now has more than 600 million users. That’s a big audience. For comparison, Twitter only has 313 million monthly active users. But it’s not the size of Instagram’s user base that makes it such an enticing marketing channel—it’s the level of engagement that brands get on the platform. Not so with Instagram. No matter how small your audience, your posts probably still receive at least a few likes and comments—especially if you use relevant hashtags. The business case for Instagram ecommerce is strong. Not only does Instagram’s engagement demolish Twitter, Pinterest, Google+, and LinkedIn, but, for brands, it even outperforms Facebook by a factor of 10. For a long time, the big problem with marketing on Instagram has been getting your fans on Instagram back to your website. Since you can’t place clickable links in your posts, brands have to direct Instagram follows to the link in their bio instead—and continuously update that link as they post new products. Although this isn’t ideal, Instagram has still been an impactful source of traffic and sales for many companies. In fact, Instagram was the most successful source of traffic in one of our recent case studies. All that traffic came from the same “link in bio”. But here’s the really exciting part. You can now include links to your website in Instagram posts — if you advertise. In the example below, the “Shop Now” button takes readers directly to a product page. Instagram advertising is still quite new. Before recently, though, there was a workaround: sponsored posts. Sponsored posts still have their place. Getting someone else to promote your product carries solid benefits. It provides social proof, adding a cool factor to your business, and people are more likely to buy something when someone they trust bought it first. Plus, while you don’t have a lot of control over the influencers audience, at least you don’t have to make any decisions about who to target. Sponsored posts are still a great way to do influencer outreach, especially if you sell a product. However, there’s now a new way. You can now run four different types of ads on Instagram. Instagram Ads offers several campaign objectives. These are potential goals for your campaign that you select from a list. Don’t neglect this choice—it will influence how your ads are optimized and how you pay for them. For example, if your goal is to get people to watch your video, you probably don’t care how people click on your link. Instagram ads have all the same targeting options as Facebook ads 🙌 . These include targeting based on location, demographics, interests, behavior, lookalike audiences, and automated targeting (let Facebook decide). Even better, if you have Custom Audiences, you can target them on Instagram. Custom Audiences are groups people who have already connected with your brand in some way. This could be by visiting your website, engaging with your posts on Facebook, using your app, or by sharing their contact info with you. 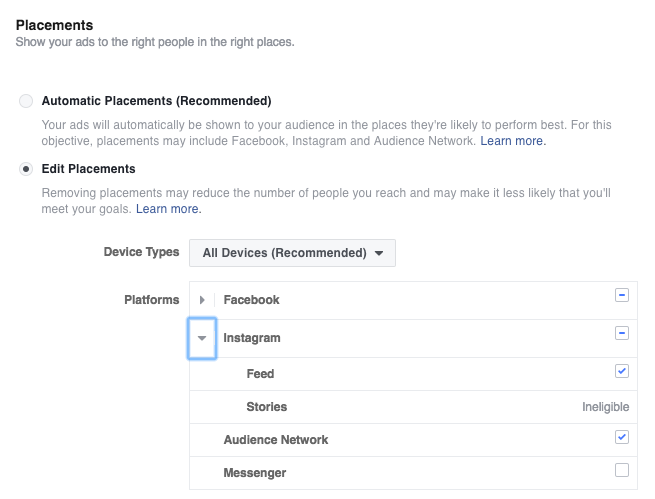 Visit the Settings for your Facebook page and click on “Instagram Ads”. 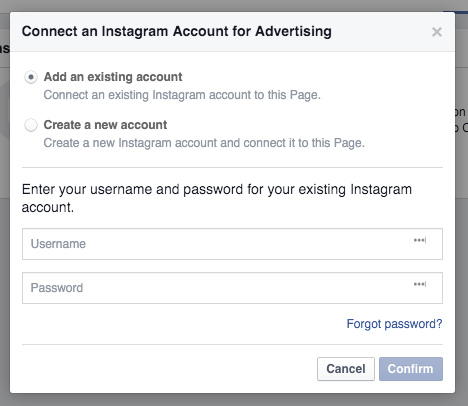 Next, click “Add an Account” and fill in your Instagram login credentials. If you don’t already have an Instagram account, you can also create one now. When you’re finished click “Confirm”. 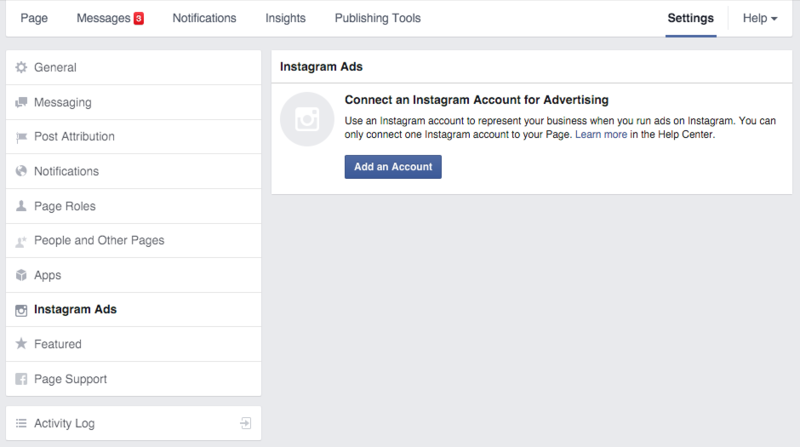 Now that you’ve linked your Instagram account to your Facebook page, it’s time to head over to the Ads Manager and create your first campaign. If you’re more comfortable using Power Editor, you can also create Instagram ads there. 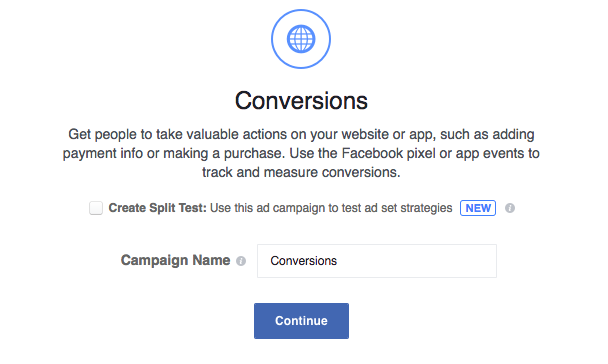 If you already create Facebook ads, much of this process will be familiar to you. In the Ads Manager, click on “+ Create Campaign” near the top left corner of the screen. Next, choose your campaign objective. Be aware that not all objectives are compatible with Instagram Stories Ads. The “Conversions” objective is great choice for ecommerce businesses that want to drive sales. Note that in order to use this objective, you need to have a the Facebook pixel installed on your website. If you don’t have one installed yet, you’ll get a message letting you know. 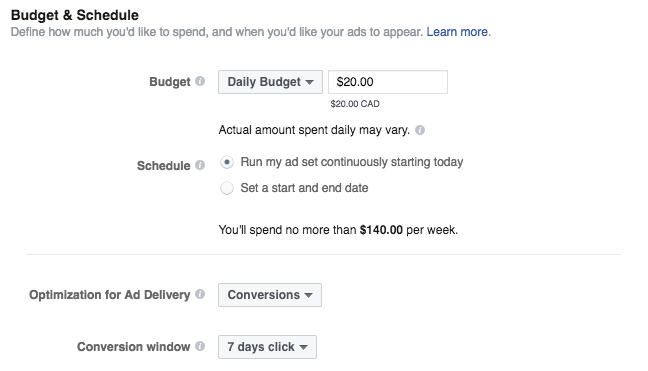 Next, you can define who you want to see your ads, and how much money you want to spend. All the same targeting options are available for Instagram ads as for Facebook ads. When figuring out how much you want to spend, I recommend starting low. You can always increase the budget later if your ad is performing well. On the next screen you’ll see an option to choose your ad format. Note that the Canvas format is not compatible with Instagram. Once you’ve decided, scroll down to upload your images or videos. After you’ve uploaded your visuals, scroll down further and you’ll see an option on the left to add text to your ad. Finally, to the right of the text editor, you’ll be able to preview how your ad will look on Instagram. Here’s how my ad would look if I uploaded a picture of our office dog, Petunia. You can also see how your ad would look in any other formats selected. Once everything looks good, click “Place Order”. Otherwise, go back and make changes. The first one is always the hardest. Once you’ve created your first ad on Instagram, it’ll be much easier the second time around. In the meantime, use the Ads Manager to keep track of how your first ad is performing.